Parents are being advised to double check the tension of car seat harnesses, particularly when their babies and toddlers wear thick coats or snowsuits this winter. 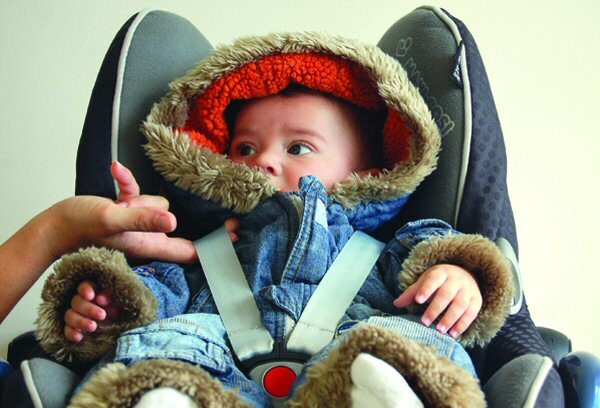 The advice comes from baby company Morrck, who says many UK parents don’t realise the effect that thick outdoor clothing can have on the fit of car seat harness straps or the potential consequences of straps being too loose. “Parents may be very surprised at the amount of slack a coat or snow suit can cause. For a car seat harness to work properly, the straps need to be tightly strapped against the child’s chest. When a child wears a snowsuit or thick coat, the straps are usually adjusted to the thickness of the coat, not the chest. If the car was in an accident, the coat could compress, making the straps too loose and reducing the level of protection for the child,” explains Isobel Thompson, mum of three and founder of Morrck, creator of the Baby Hoodie. Do the Two finger test. If you can fit more than two fingers underneath the harness at the child’s shoulder bone, the harness tension needs to be tightened or avoid using the coat in the car seat. “To get the correct harness tension over a puffy snowsuit or thick coat, a parent really has to tighten it substantially, which can make the child uncomfortable as their freedom of movement is restricted. 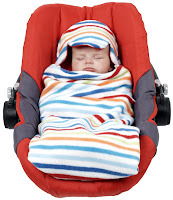 Being tightly strapped in a thick coat can also lead to the child overheating once the car warms up,” explains Isobel. Morrck’s Baby Hoodie helps keep babies both warm and safe as it fits into a car seat, with slots for the harness straps to pass through. The baby is then strapped in as normal with the straps tight against their chest. The hoodie is then wrapped around the baby, keeping them snug and warm, but is easy to fold open once the car heats up. As it has no fastenings, clips, zips or Velcro, it also offers easy access to the harness release button. And we have one of these fabulous Morrck Baby Hoodies to giveaway - you can choose between the Rambler (the warmest one) or the All Season Hoodie! All you have to do to be in with a chance of winning is comment below (or email secondtimemum@live.co.uk with the subject line "I want to win a Baby Hoodie") and tell us which hoodie you would choose if you won (make sure you include the colour/pattern). For a bonus entry tweet "I've entered to win a @Morrck Baby Hoodie @second_time_mum's blog http://bit.ly/bTy2of " but make sure you comment (or email) separately for your extra entry to count! Competition closes 7th November 2010. The winner will be selected using Random.org. think I'd have to go for the All Season in cool spot/ poppy. Love the organic one though! Oooh, I love these! It would have to be the All Season Baby Hoodie in lime/charcoal - beautiful! I'd go for an all season hoodie in stripe/blue for my best friend whose little boy is due on Friday. I have just had my third baby (6 weeks), and i wish i had known about morrck for my other two. I have one already but i couldnt live without it!!! Brilliant product!! WOw this is great, I would love a size 3 please, fabulous idea! "I want to win a Baby Hoodie"
THESE LOOK GREAT, SNUG AS A BUG IN A RUG!!!! I love these! My fave is the charcoal/poppy All Season hoodie! Wow, these are gorgeous! My favourite is the Green Stripe/Red Rambler, it looks so cosy! I love the Rambler in red and green stripe too, size 1. Oh I love these, I really like the rambeler in cool spot/red my little monkey would look cool in that she would be the envy on playgroup. the all season in cool spot/poppy! how cool is this! I love the All Season Baby Hoodie - Cool Spot/Poppy ! I want to win a Baby Hoodie... the All Season Hoodie in Charcoal/Poppy and size 4-18 months. I want to win a Baby Hoodie - the All Season Baby Hoodie in Green Stripe/Poppy in size 1 would be fantastic for my baby boy. What a fantastic product !! I'd love the All Season Hoodie in Cool Stripe Poppy. Hi, thanks for the comp, the Rambler one in blue would be lovely, thanks! RT'd on Twitter as @cobbiecollinge cheers! I think I would have to choose the All Season Baby Hoodie - Stripe /Fuschia in size 2: 5-18 months. I am off to tweet now! Would love the All Season - Stripe /Fuschia.